This article is about calculating the area of a triangle. For calculating a square root, see Heron's method. A triangle with sides a, b, and c.
In geometry, Heron's formula (sometimes called Hero's formula), named after Hero of Alexandria, gives the area of a triangle when the length of all three sides are known. Unlike other formulas, there is no need to calculate other distances in the triangle first. In this example, the side lengths and area are all integers, making it a Heronian triangle. However, Heron's formula works equally well in cases where one or all of these numbers is not an integer. The formula is credited to Heron (or Hero) of Alexandria, and a proof can be found in his book, Metrica, written c. CE 60. It has been suggested that Archimedes knew the formula over two centuries earlier, and since Metrica is a collection of the mathematical knowledge available in the ancient world, it is possible that the formula predates the reference given in that work. was discovered by the Chinese independently of the Greeks. It was published in Shushu Jiuzhang (“Mathematical Treatise in Nine Sections”), written by Qin Jiushao and published in 1247. Heron's original proof made use of cyclic quadrilaterals, while other arguments appeal to trigonometry as below, or to the incenter and one excircle of the triangle . The difference of two squares factorization was used in two different steps. Triangle with altitude h cutting base c into d + (c − d). Geometrical significance of s − a, s − b, and s − c. See the Law of cotangents for the reasoning behind this. The brackets in the above formula are required in order to prevent numerical instability in the evaluation. 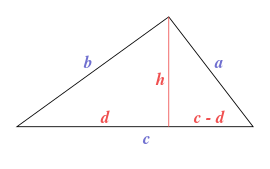 where D is the diameter of the circumcircle: D = a/sin α = b/sin β = c/sin γ.
Heron's formula is a special case of Brahmagupta's formula for the area of a cyclic quadrilateral. Heron's formula and Brahmagupta's formula are both special cases of Bretschneider's formula for the area of a quadrilateral. Heron's formula can be obtained from Brahmagupta's formula or Bretschneider's formula by setting one of the sides of the quadrilateral to zero. Heron's formula is also a special case of the formula for the area of a trapezoid or trapezium based only on its sides. Heron's formula is obtained by setting the smaller parallel side to zero. illustrates its similarity to Tartaglia's formula for the volume of a three-simplex. Another generalization of Heron's formula to pentagons and hexagons inscribed in a circle was discovered by David P. Robbins. ^ "Fórmula de Herón para calcular el área de cualquier triángulo" (in Spanish). Retrieved 30 June 2012. ^ Kendig, Keith (2000). "Is a 2000-Year-Old Formula Still Keeping Some Secrets?". Amer. Math. Monthly. 107: 402–415. doi:10.2307/2695295. ^ Heath, Thomas L. (1921). A History of Greek Mathematics (Vol II). Oxford University Press. pp. 321–323. ^ Weisstein, Eric W. "Heron's Formula". MathWorld. ^ Niven, Ivan (1981). Maxima and Minima Without Calculus. The Mathematical Association of America. pp. 7–8. ^ Raifaizen, Claude H. (1971). "A Simpler Proof of Heron's Formula". Mathematics Magazine. 44 (1): 27–28. ^ The second part of the Law of cotangents proof depends on Heron's formula itself, but this article depends only on the first part. ^ Sterbenz, Pat H. (1974-05-01). Floating-Point Computation. Prentice-Hall Series in Automatic Computation (1st ed.). Englewood Cliffs, New Jersey, USA: Prentice Hall. ISBN 0-13-322495-3. ^ William M. Kahan (24 March 2000). "Miscalculating Area and Angles of a Needle-like Triangle" (PDF). ^ Benyi, Arpad, "A Heron-type formula for the triangle," Mathematical Gazette" 87, July 2003, 324–326. ^ Mitchell, Douglas W., "A Heron-type area formula in terms of sines," Mathematical Gazette 93, March 2009, 108–109. ^ D. P. Robbins, "Areas of Polygons Inscribed in a Circle", Discr. Comput. Geom. 12, 223-236, 1994. ^ W. Kahan, "What has the Volume of a Tetrahedron to do with Computer Programming Languages? ", , pp. 16–17. "Heron's Formula and Brahmagupta's Generalization". MathPages.com.